In Election, a sermon delivered by the great teacher Rev. 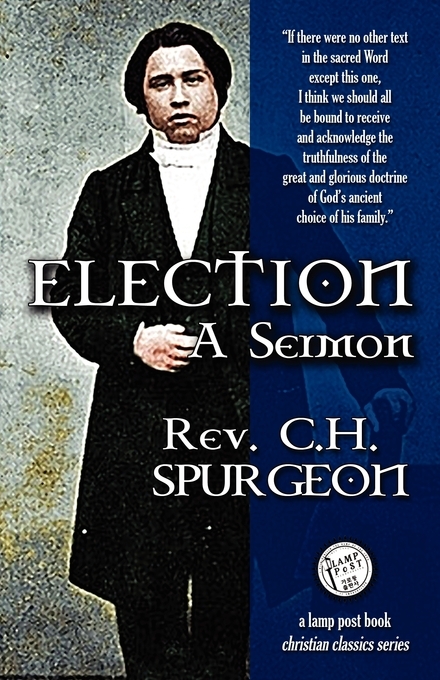 Charles Haddon Spurgeon in September 1855, he states, "Election in the Christian should make him very fearless and very bold. No man will be so bold as he who believes that he is elect of God. What cares he for man if he is chosen of his Maker? What will he care for the pitiful chirpings of some tiny sparrows when he knoweth that he is an eagle of a royal race? Will he care when the beggar pointeth at him, when the blood royal of heaven runs in his veins? Will he fear if all the world stand against him?" Here is one of the most gripping and succinct messages on the subject ever delivered! Election by C H Spurgeon; Charles Haddon Spurgeon was published by Lamp Post Inc. in April 2009 and is our 36110th best seller. The ISBN for Election is 9781600391002. Be the first to review Election! Got a question? No problem! Just click here to ask us about Election.